Answers by Daniel Mesa below in blue. If the Godhead is composed only by the Father and the Son (only two persons), why the Lord Jesus commanded to baptize in the name of three persons? “Go ye therefore, and teach all nations, baptizing them in the name of the Father, and of the Son, and of the Holy Ghost”—Matthew 28:19. The Father’s name is not “Father”. It’s the title for His position in the family of God. The Son’s name is not “Son”. It’s the title for His position in the family of God. Your conclusion would have to be that we should use titles or names for the three when only one name is required. Also, please show me a single time when someone is baptized in that way in all the Bible. The New Testament (NT) gives only examples of being baptized in the name of Jesus. If the Holy Spirit isn’t a divine person, why Jesus and the apostles placed Him on the same level of the Father and the Son? “The grace of the Lord Jesus Christ, and the love of God, and the communion of the Holy Ghost, be with you all. Amen”—2Corinthians 13:14. This is not on the same level. That is a human construct. Even Jesus said, “My Father is greater than I.”—John 14:28. This is being baptized into the family of God: the Father, Son, and Their Spirit. Notice John 14:23, “If a man love me, he will keep my words: and my Father will love him, and we will come unto him, and make our abode with him. Do you know what grace is? “They must have His grace, the Spirit of Christ, to help their infirmities, or they cannot resist evil.”—Steps to Christ, 52.2. Grace IS the communion of the Holy Spirit. Who’s Spirit? The same one that was in the prophets! The prophets were “Searching what, or what manner of time the Spirit of Christ which was in them did signify…”—1 Peter 1:11. If the Holy Spirit is only the spirit of God and/or of Christ, how could He be the “another Comforter” promised by our Savior? “And I will pray the Father, and he shall give you another Comforter, that he may abide with you for ever”—John 14:16. 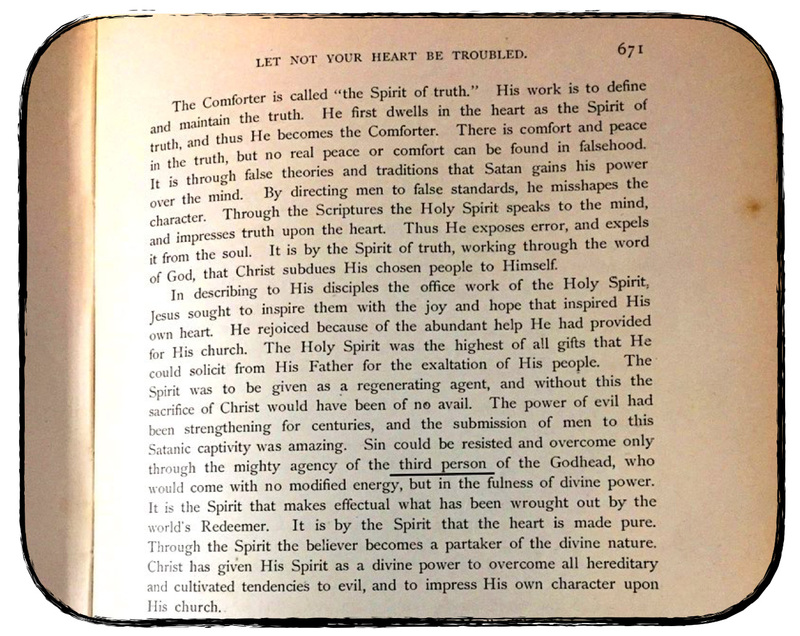 Jesus just afterward says, “Even the Spirit of truth…” in verse 17.
Who is the Truth according to 14:6? Jesus, right? So, who’s Spirit is the Spirit of Truth? The Spirit of Truth was dwelling WITH them, and would be (future tense) IN them. THEN, Christ says, “I will come to you” in verse 18. What things? About the Comforter? The Vine? The laboring woman? Yes! If the Holy Spirit is not a person how could He be blasphemed? “And whosoever speaketh a word against the Son of man, it shall be forgiven him: but whosoever speaketh against the Holy Ghost, it shall not be forgiven him, neither in this world, neither in the world to come”—Matthew 12:32. “But he who blasphemes against the Holy Spirit never has forgiveness, but is subject to eternal condemnation”—Mark 3:29, NKJV. Also, in John 10:1-4, Jesus speaks of HIMSELF in the third person as the Shepherd. He calls Himself “He,” “His,” “Him.” Why, in another section that Christ calls a parable or proverb, is it such a big deal if He calls Himself “He,” “His,” and “Him” when calling Himself the Comforter? The entire Jewish nation blasphemed the Holy Spirit when they rejected the “Spirit of truth [Jesus], which proceedeth from the Father.”—John 15:26. If the Holy Spirit is only a divine influence from God the Father and Jesus Christ, how can He make intercession for the saints, helping them how to pray? “Likewise the Spirit also helpeth our infirmities: for we know not what we should pray for as we ought: but the Spirit itself maketh intercession for us with groanings which cannot be uttered. And he that searcheth the hearts knoweth what is the mind of the Spirit, because he maketh intercession for the saints according to the will of God”—Romans 8:26, 27. Just as the DA says in 166.2 as quoted at the end of #3 above, the Spirit of Christ helps us to pray, interceding for us! You know, there’s only ONE Intercessor / Mediator? “For there is one God, and one mediator between God and men, the man Christ Jesus”—1 Timothy 2:5. If the Holy Spirit is not a person, how could He testify? “The Holy Spirit also testifies to us about this”—Hebrews 10:15, NIV. “Searching what, or what manner of time the Spirit of Christ which was in them did signify, when it testified…”—1 Peter 1:11. Question, Who, or what, testified? If the Holy Spirit exists only from Pentecost of AD 31, what “Holy Spirit” David asked to take not from him? “And do not take Your Holy Spirit from me”—Psalm 51:11, NKJV. God the Father is Spirit (John 4:23-24). The Son was begotten in the express image of His Father (John 3:16, Hebrews 1:3). The Son, therefore, would be Spirit as well as the Father! =) So… Christ came to this earth personally in the OT, just as He does in the NT—through His Spirit! Though Christ came to this earth with the body His Father had prepared for Him (See Hebrews 10:5). David received the victorious Spirit of Christ just as Adam did—by faith! This is how they both received the promise of forgiveness as well. (Christ hadn’t died yet, so how could they be forgiven… by lambs? NO! Christ hadn’t been a victorious human yet, so how could they be victorious… by trying? NO! But by faith in the coming Christ! If the Holy Spirit exists only from Pentecost of AD 31, what “Holy Ghost” caused Mary to be pregnant? “And the angel answered and said unto her, The Holy Ghost shall come upon thee, and the power of the Highest shall overshadow thee”—Luke 1:35. Jesus said He didn’t know certain things (His coming, for example, in Matthew 24:36). Also, only the Father has foreknowledge—which only occurs only four times in the Bible (Acts 2:23, Romans 8:29, 11:2, 1 Peter 1:2). So, Christ said, “The Father is greater than I.”—John 14:28. If the Holy Spirit exists only from Pentecost, what “Holy Spirit” anointed our Lord and Savior Jesus Christ at His baptism and drove Him out into the wilderness? “In those days Jesus came from Nazareth of Galilee and was baptized by John in the Jordan. And when he came up out of the water, immediately he saw the heavens being torn open and the Spirit descending upon him like a dove. […] The Spirit immediately drove him out into the wilderness”—Mark 1:9, 10, 12, ESV. “How God anointed Jesus of Nazareth with the Holy Ghost and with power”—Acts 10:38. If the Lord Jesus isn’t God as the Father, why the Bible calls Him “God”? “For unto us a child is born, unto us a son is given: and the government shall be upon his shoulder: and his name shall be called Wonderful, Counsellor, The mighty God, The everlasting Father, The Prince of Peace”—Isaiah 9:6. “Behold, a virgin shall be with child, and shall bring forth a son, and they shall call his name Emmanuel, which being interpreted is, God with us”—Matthew 1:23. “In the beginning was the Word, and the Word was with God, and the Word was God”—John 1:1. “No one has ever seen God; the only God, who is at the Father’s side, he has made him known”—John 1:18, ESV. I don’t read this in the Strong’s Concordance when looking… This is a bit of a stretch to me to use another version to state what you wish to convey. “And Thomas answered and said unto [Jesus], My Lord and my God”—John 20:28. “Whose are the fathers, and of whom as concerning the flesh Christ came, who is over all, God blessed for ever. Amen”—Romans 9:5. “For in [Jesus] dwelleth all the fullness of the Godhead bodily”—Colossians 2:9. “And without controversy great is the mystery of godliness: God was manifested in the flesh”—1Timothy 3:16. How can Jesus be fully God if He’s not co-eternal with the Father? “Before the mountains were brought forth, or ever thou hadst formed the earth and the world, even from everlasting to everlasting, thou art God”—Psalm 90:3. If Jesus is not God as the Father is, why He claimed the divine name as His own? “And God said unto Moses, I AM THAT I AM: and he said, Thus shalt thou say unto the children of Israel, I AM hath sent me unto you”—Exodus 3:14. “Jesus said unto them, Verily, verily, I say unto you, Before Abraham was, I am”—John 8:58. “It was Christ who from the bush on Mount Horeb spoke to Moses saying, ‘I AM THAT I AM…. Thus shalt thou say unto the children of Israel, I AM hath sent me unto you.’ Exodus 3:14. This was the pledge of Israel’s deliverance. So when He came ‘in the likeness of men,’ He declared Himself the I AM”—The Desire of Ages, p. 24. “With solemn dignity Jesus answered, ‘Verily, verily, I say unto you, Before Abraham was, I AM.’ Silence fell upon the vast assembly. The name of God, given to Moses to express the idea of the eternal presence, had been claimed as His own by this Galilean Rabbi. He had announced Himself to be the self-existent One, He who had been promised to Israel, ‘whose goings forth have been from of old, from the days of eternity.’ Micah 5:2, margin”—The Desire of Ages, p. 469. “I AM THAT I AM” in Hebrew is ‘eyeh asher ‘eyeh. The form ‘eyeh, “I am”, is the first person of the present tense of the verb hayah, “to be”. God’s covenant name, Yahweh or Jehovah, is the third person of the present tense of the verb hayah. In other words, the Lord Jesus saying “I am” in Jhn 8:58 claimed to be the Old Testament’s Jehovah, the God of Israel. If Jesus isn’t co-eternal with the Father, why He said to John the revelator to be the One “who is and who was and who is to come”? “ ‘I [Jesus] am the Alpha and the Omega, the Beginning and the End,’ says the Lord, ‘who is and who was and who is to come, the Almighty.’ ”—Revelation 1:8, NKJV. “What a Saviour we have! It was he that revealed himself to John on the Isle of Patmos, and proclaimed, ‘I am Alpha and Omega, the beginning and the ending, saith the Lord, which is, and which was, and which is to come, the Almighty.’ None but just such an ever-living, mighty God, could pay the ransom to save sinners from going down into the pit of death”—Review & Herald, February 18, 1896. If Jesus is not almighty (or omnipotent, or all-powerful) why the Holy Scriptures and the Spirit of Prophecy say that He’s almighty? Again, this which is bolded in verse eight, is referring to the Father speaking of His Son. Jesus, in Isaiah 9:6 is called “the mighty God” not the Almighty. “[Jesus] was equal with God, infinite and omnipotent. He was above all finite requirements. He was Himself the law in character”—Manuscript Releases, vol. 12, p. 395. Why is Jesus Christ, the Son of God, equal? “God is the Father of Christ; Christ is the Son of God. To Christ has been given an exalted position. He has been made equal with the Father…” —8T 268.3. These concepts can be brought out in Proverbs 8:22-30 and Hebrews 1. If Jesus isn’t equal with God the Father, why the Spirit of Prophecy says instead that He’s equal with God? If the Son of God is not co-eternal with the Father, why the messenger of the Lord said that He always was with God? “From all eternity Christ was united with the Father, and when He took upon Himself human nature, He was still one with God. He is the link that unites God with humanity”—Selected Messages, book 1, p. 228. “Christ was God essentially, and in the highest sense. He was with God from all eternity, God over all, blessed forevermore”—The Truth About Angels, p. 23. “From” does not mean through or throughout. If there were a statement that said something like, ‘Christ was God throughout eternity, and there never was a time when He was not,’ there would be something to talk about. But we don’t have those statements. “In speaking of His pre-existence, Christ carries the mind back through dateless ages. He assures us that there never was a time when He was not in close fellowship with the eternal God. He to whose voice the Jews were then listening had been with God as one brought up with Him”—The Signs of the Times, August 29, 1900 (see 7ABC 440.4). I used to use the same quote—taken out of the compilation “Evangelism.” BUT, this is not saying what many are hoping it is saying. It does not say, ‘there never was a time when He was not…’ This is speaking of fellowship, not existence. Therefore, after He was begotten, there never was a time when He was not in close fellowship with the eternal God. (Notice the differentiation in the quote iteself.) You CAN say that about the Son, but you CANNOT say that about the Father. There WAS a time when the Father was without close fellowship with His Son—just as it is true that there was a time when Adam was without close fellowship with Eve. If Christ was born from the Father, why the Spirit of Prophecy says that He is “self-existent” and that His life is “original, unborrowed, underived”? “ ‘Before Abraham was, I am.’ Christ is the pre-existent, self-existent Son of God. The message He gave to Moses to give to the children of Israel was, ‘Thus shalt thou say unto the children of Israel, I AM hath sent me unto you.’ The prophet Micah writes of Him, ‘But thou, Bethlehem Ephratah, tho thou be little among the thousands of Judah, yet out of Thee shall He come forth unto Me that is to be ruler in Israel; whose goings forth have been from of old, from everlasting.’ ”—The Signs of the Times, August 29, 1900. “Still seeking to give a true direction to her faith, Jesus declared, ‘I am the resurrection, and the life.’ In Christ is life, original, unborrowed, underived. ‘He that hath the Son hath life.’ 1 John 5:12”—The Desire of Ages, p. 530. Don’t forget the “in Christ” motif. It doesn’t say “Christ WAS life…” So, what, according to Christ’s own words was in Him? John 14:10 says it was the Father that was in Him! “But the life of Christ was unborrowed. No one can take this life from Him. ‘I lay it down of myself’ (John 10:18), He said. In Him was life, original, unborrowed, underived”—Selected Messages, book 1, p. 296. If the Godhead is composed only by God the Father and His Son, why the Spirit of Prophecy calls it “the heavenly trio”? “There are three living persons of the heavenly trio; in the name of these three great powers—the Father, the Son, and the Holy Spirit—those who receive Christ by living faith are baptized, and these powers will co-operate with the obedient subjects of heaven in their efforts to live the new life in Christ”—Special Testimonies, Series B, No. 7, pp. 62, 63 (see Ev 615.1; 7ABC 441.9). Christ’s Spirit IS the third person of the Godhead. It’s the third person grammatically, not actually. The Spirit is not a being, and if it were, the spirit would have a spirit, which would constitute confusion. If someone could show that a spirit is something owned by other than the being who possesses it, then I will have to rethink this, but as far as I can tell, a spirit belongs to the being who’s spirit it is. If the Holy Spirit is not a divine person, but only the spirit of Christ and of God, why the messenger of the Lord declared Him to be “the third person of the Godhead”? “The Spirit was to be given as a regenerating agent, and without this the sacrifice of Christ would have been of no avail. The power of evil had been strengthening for centuries, and the submission of men to this satanic captivity was amazing. Sin could be resisted and overcome only through the mighty agency of the Third Person of the Godhead, who would come with no modified energy, but in the fullness of divine power”—The Desire of Ages, p. 671. Also, the quote has been changed. I own an original 1898 print of The Desire of Ages. Page 671.2 shows the words “third person” in lower case, not title case as it reads in the quote above. The phrase “third person” is not meant to be a title, but rather a grammatical expression of Christ’s Spirit. Embedded below is a picture of said book and page. “Christ determined that when He ascended from this earth, He would bestow a gift on those who had believed on Him, and those who should believe on Him. What gift could He bestow rich enough to signalize and grace His ascension to the mediatorial throne? It must be worthy of His greatness and His royalty. He determined to give His representative, the third person of the Godhead. This gift could not be excelled. He would give all gifts in one, and therefore the divine Spirit, that converting, enlightening, and sanctifying power, would be His donation”—S.D.A. Bible Commentary, vol. 6, p. 1052. If the Holy Spirit isn’t a person, why Sister White said that “we need to realize that the Holy Spirit” is a person? “The Lord instructed us that this was the place in which we should locate, and we have had every reason to think that we are in the right place. We have been brought together as a school, and we need to realize that the Holy Spirit, who is as much a person as God is a person, is walking through these grounds, that the Lord God is our keeper, and helper. He hears every word we utter and knows every thought of the mind”—Manuscript Releases, vol. 7, p. 299.